Wright Howes (1882-1978), a highly regarded bookseller based in Chicago, is remembered for his fundamental bibliography on Americana, U.S.IANA. 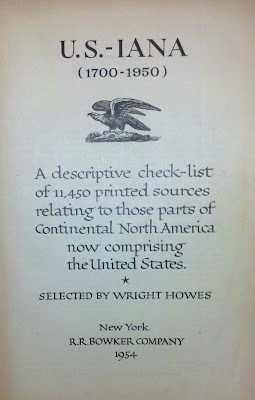 This bibliography of uncommon and rare Americana is enhanced by Howes’ concise and witty annotations. He was an acknowledged master in the field. 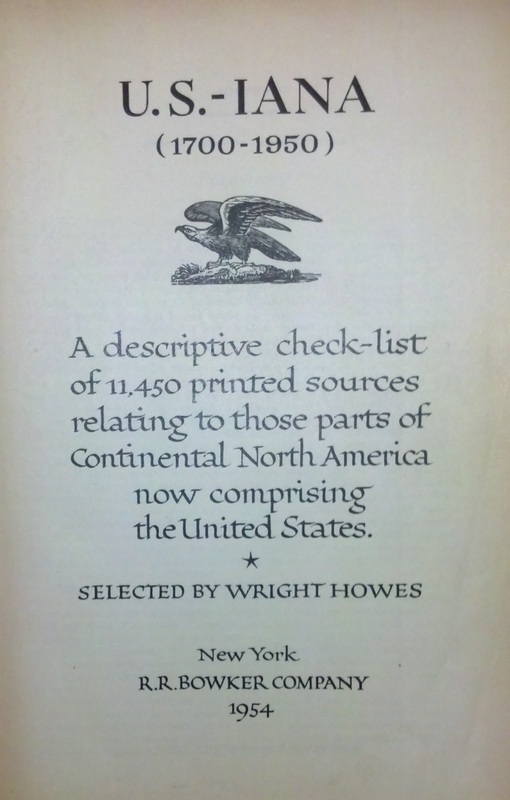 The first edition was published by R. R. Bowker Company in 1954 under the title U.S.-IANA (1700-1950): A Descriptive Check-List of 11,450 Printed Sources Relating to Those Parts of Continental North America Now Comprising the United States. Howes considered the first edition a work in progress and welcomed input on revisions and additions. He labored diligently on a definitive second edition that appeared in 1962. The first and second editions sold quickly and remain essential for any book person interested in the subject. I highly recommend John Blew’s recent article about Wright Howes and his bibliography in the April 2012 Caxtonian. (http://www.caxtonclub.org/reading/2012/apr12.pdf). Book Hunt success! The book’s owner, Edward J. Lazare (1904-1991) was himself one of the most highly regarded and formidable bookmen of his time. He cut his teeth with David Randall and Jacob Blanck working at Max Harzof’s famous New York City bookshop, G. A. Baker and Co. Lazare would go on to become the owner/editor of American Book Prices Current from the 1940s to 1965. He utilized his expertise in Americana, for example, when he prepared the index volume for the Thomas Streeter auction sale catalogue (1969). Lazare’s annotated copy of Howes then would be an important artifact in American book trade history. I was excited about this most satisfying association and I ordered the book. Time crawled and what was only a week seemed like thrice that. The book arrived, the package opened, and a book rush that is known to all that play the game. I was getting to know my new acquisition and I scanned the flyleaf for Lazare’s name and address as indicated in the bookseller’s email. Oddly, nothing. No notations at all on either the pastedown or front fly. Lily white, clean as a cloroxed sock. A small knot in my stomach. I examined the half title, the rear endpaper and pastedown. Not even a bookseller’s note. The knot grew tighter. This was either the wrong copy or the ownership markings including Lazare’s name and address had been erased! At this point, my book rush had become a crash and burn. I hastily went through the rest of the book and found it still intact with many annotations and markings. All the items with a rarity rating of “b” or above were marked, typos and errors corrected, and there were scattered notations regarding specific titles, prices at auction, etc., throughout. Fortunately, I recognized the markings and handwriting because I have other items from Lazare’s library. It was apparent that he kept the book close at hand and used it often. But his ownership—his name and address—were gone! I muttered a few special occasion obscenities and my wife wondered what was going on. I told her and she too was appalled. Jaw drop. My book blood had reached a hard boil. “To say I'm shocked by the response below is an understatement. Is it a regular policy to erase ownership inscriptions? In twenty-five years of collecting I've never had to request an ownership signature NOT be erased. I would have thought given my specific inquiry about the book previous ownership it was obvious the provenance was important. I was buying it for the provenance. The only saving grace is that Lazare's handwritten notations are enough to identify the copy as his. To put the copy in perspective: the Howes bibliography is one of the most important Americana references cited. This is a first edition. The owner, Edward Lazare, was one of the great American bookmen. . . . So, as you can see this is a very important copy and you guys just erased Lazare's ownership inscription! Ouch, to say the least. In the literary field it would be equivalent to erasing Fitzgerald's ownership signature in a Faulkner title to tidy it up a bit. My blood’s hard boil had been reduced to a simmer. The email exchange accomplished its purpose but frankly left me with an unsatisfactory feeling. I understand that mistakes happen. However, this is a bookseller of the highest standing whose staff should know such basics. I felt the bookseller could have responded at greater length with a more concerned attitude. But in the end the book’s the thing and I’ve already penciled a new note in the front indicating it was Edward Lazare’s copy, laying in the correspondence above. I strongly considered writing the note in ink but it just didn’t seem right. This is an example of what can happen When Worlds Collide.... So, for instance, worker-bees trained in what can often be the antiseptic environment of Modern First Editions (where books are perfect, authorial inscriptions are avoided for all but the most famous or book related of inscribees... in short, any hint of individual personality is eschewed at all costs), serving customers equally obsessed, never learn to hear/see/appreciate the stories that Each and Every Individual Book wants to tell us. Nicely put, Joe. Antiseptic book collecting has its consequences. However, this is a bookseller of the highest standing whose staff should know such basics. I felt the bookseller could have responded at greater length with a more concerned attitude. I strongly agree with your second sentence and reading the first one cannot but wonder why you weren't at least offered a significant discount rather than the standard ability to return.